What is a true learning organization, and how can your school become one? To excel, schools must embrace continuous school improvement and evaluation, as well as systems thinking. 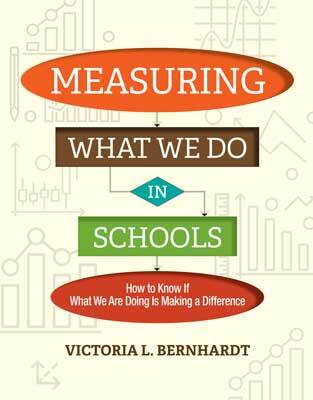 In Measuring What We Do in Schools, author Victoria L. Bernhardt details the crucial role program evaluation serves in school success and how to implement meaningful evaluations that make a difference. She provides a road map of how to conduct comprehensive, systemwide evaluations of programs and processes; the tools needed to obtain usable, pertinent information; and how to use these data to expand teachers' and administrators' data-informed decision-making focus. Assess what is working and not working for students. Determine which processes need to change. Use data to improve practices on an ongoing basis. Although challenging for many schools, program evaluation and data analysis can begin with a single program or process, over time building on the expanded knowledge of the school's processes and the results they produce. An effective tool—The Program Evaluation Tool—enables schools to easily identify the purpose and intended outcomes of any school program, along with whom it serves, and how it should be implemented, monitored, and evaluated. These data can then be used to improve every aspect of a school's programs and processes and the outcomes achieved. Filled with practical strategies and featuring an in-depth case study, this book is designed to help educators see that evaluation work is logical and easy to do. They'll gain the confidence to do this work on a regular basis—working together to become a true learning organization. Victoria L. Bernhardt, PhD, is executive director of the Education for the Future Initiative, whose mission is to build the capacity of learning organizations at all levels to gather, analyze, and use data to continuously improve learning for all students.